Nigel Farage, leader of the UK Independence Party, is claiming a victory for the Leave camp just hours after declaring a defeat. 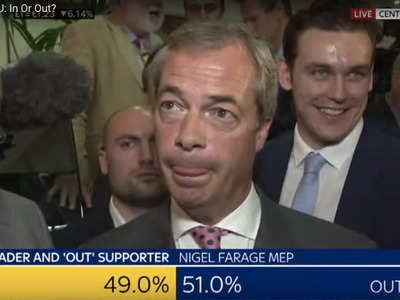 “The dawn is breaking on an independent United Kingdom,” Farage said on Sky News. Support for Leave, those who want to leave the European Union in a so-called Brexit, is growing as more results from the vote on Britain’s membership in the EU roll in from local counting areas. A decisive victory for Brexiteers in Sunderland has sent the pound crashing to a 30-year low.